At last I found a remedy for athlete’s foot. I had endless problems and had been to numerous doctors but no medication helped and I thought I was going to lose my toe. I started to use Melaskin and it is healing and no more itching and after 11 months of agony I have at last found the cure. Thank you for a wonderful product. Just want to say what an awesome product you have! I was on an isotretinoin-based product for years and had to come off for health reasons. My skin flared up again. A friend introduced me to Melaskin and I have not looked back! My skin is absolutely clear and in much better condition than it’s ever been. Thank you. Wish you made a shampoo! I am writing to you to tell you what a wonderful product Melaskin is. I have suffered with a foot fungus for many years, similar to athlete’s foot, but this one is mainly on my heels. I have used many expensive pharmaceutical creams but it kept re-occurring. I purchased a jar of Melaskin and with in 3 days it was gone and has not returned. I have since used your cream for other skin allergies, fever blisters and even as a face cream. Thank you for putting this miracle cream on the market. A customer of mine works non-stop in the blazing sun and even with a hat, his nose has been eaten alive by the sun. He has been suffering from Solar Keratosis so badly that has almost eaten the top of his nose away. Nothing helped until I offered him a sample of Melaskin. Within that one sample the scab/black dead skin, has softened and fallen off and underneath was appearing a brand new layer of fresh skin. He was telling me, that all his friends cannot believe the difference. Well done for a great product. I wanted to drop you a note to let you know how much my husband and I have appreciated using Melaskin. 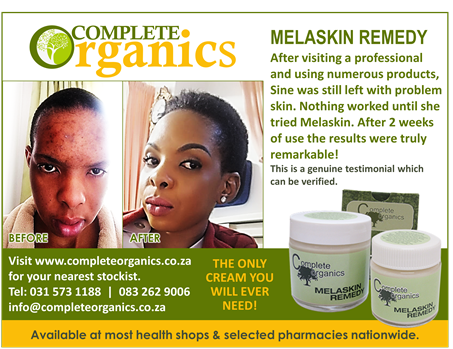 My husband had a skin cancer sore cut from his upper ear in July, 2010 and I bought Melaskin at the Natural & Organic Exhibition in August. He has been using it daily and the scar has healed completely and he is now addicted to the product! I was diagnosed with eyelid dermatitis three weeks ago and this condition has spread to my wrists, which were both red and sore. Instead of using the cortisone cream prescribed, I decided to try some Melaskin on my wrists and they are almost completely healed. Another week or so and they will be as good and new. Please let me have another two bottles of the 50ml Melaskin Remedy. I have written to tell you how great your product worked for my son 5 yrs who had very bad Molluscum contagiosum all over his body. He was scheduled to go for a operation to have these lesions removed as you cannot get rid of them and they spread like a a wild fire. Well I bought your Melaskin Remedy at the Hillcrest health shop and after the first week there was already a great improvement! It's now all gone after a month of using it and after 5 containers! I just wanted to let you know that it really works for these lesions and its heals the molluscum completely! So please tell all your moms out there because I know there is lots of children out there who battles with it! Thanks to a Great Product that works wonders even for my sons eczema! You asked me to let you know how I got on with the the Melaskin Remedy for my 5 year old’s molluscum. Talia only had 1 persistent molluscum left by the time I found your product after using very a expensive cream on script. The cream did not seem to help, they just seemed to fade away after she got better after being very ill with bacterial and viral infections. The last molluscum had been persistent for over 5 months. I’m pleased to tell you that it has faded completely after about 3 weeks of using the cream at night. I have also used the cream at night as it works fantastically as a face cream! I often get fever blisters (cold sores) and have tried almost everything on the market as well as every home-remedy there is. Now, as soon as the tingle in my lips start, I apply your cream and within half a day my lip is as good as new and life can carry on. “Working in my garden with new indigenous plants and compost I ended up with a red rash on my knuckles that was very painful and unsightly. I applied the Melaskin as often as possible and it alleviated the pain immediately and the rash was gone in a week. Wonderful product for so many ailments”. Two weeks ago, my friend Leighann (one of your customers) dropped around a jar of Melaskin to help me with an ongoing eczema problem with my 9 year old daughter. We have battled with this skin condition since she was a baby and have had to give in to cortizone cream many times. We have now been using the cream for 10 days and for the first time ever, my daughter is about 90 percent clear. The battle with excema is made more difficult as we live in Singapore which is constantly hot and as she plays outdoor sports, flare ups are common. With the cream so far, the peaks are way down. Also, two days ago I decided to try your cream on two scaly bumps of skin I have had for a couple of years on my face, they are half gone by applying three time a day. We are now, two thirds of the way through our 50 ml jar and now require some asap. In addition, I told a friend of mine today about the cream and would like to get some for her. How do we order please? Thanks for your great product. If you would like a testimonial for your site I can write one separately. Thank you for a wonderful cream, i have suffered from Dyshidrotic Exzema for a number of years and have tried every cream on the marked, cortizone, apple cider and many more, nothing has helped until Irma at X pharmacy told me to try Melaskin, i have been using it twice a day with remarkable results, my hands have cleared completly and only a few remain on my feet, but nothing like it was. Thank you thank you what a relief, just wait until i see my doctor for my yearly check up, he will be hearing about your wonderful cream. Keep up the amazing work and please do not change the product IT WORKS. I just bought another 2 bottles so i never run out, maybe a soap will also be a good addition, especially for us allergy sufferers.